Arcade inspired music video is turned into playable game by fans. Though The Dragon Age Keep, Bioware’s solution to replicating player’s world state on to multiple platforms was released among the world through open beta last week; I was lucky enough to be invited to test out the closed beta version as part of the final wave of those who applied previously. The Keep has been in development since the end of 2013 and fans of Bioware’s famous fantasy RPG are eager to see if this will solve the complications of importing their previous world state of Thedas. The real question is, however, does it live up to expectations? Below are my initial impressions of what The Keep will offer to die-hard and new fans alike, and whether or not this hugely significant addition to the Dragon Age saga has been worth all its hype. As you can perhaps already guess, beta testers can be hugely helpful and provide fresh views to developers, whose extremely close proximity to the project often means that they see it solely from a certain perspective. So fresh eyes, particularly from fans, are more than welcome to a project that has such high expectations as The Dragon Age Keep. With this being the case, it must be said that as a Beta tester it can be easy to sometimes forget that this is still a product that isn’t entirely finalised and will no doubt be subject to change right up until Dragon Age: Inquisition’s release in November. The beauty of this being that it keeps us interested in what else Bioware has in store for fans; and more importantly how exactly we can use the Keep to manipulate plot choices in order to generate our perfected world state of Thedas. While many have been keeping up to date with all things Dragon Age via Bioware’s latest Twitch streams hosted by the developers, for those who want to keep an air of mystery until the open beta on Wednesday, you will not be disappointed by their efforts. To be bold, the Dragon Age Keep feels like a completely fresh look at interactive storytelling. It should be said however, that although the Keep has definite hints of Bioware’s previous interactive titles such as Mass Effect’s Genesis series through picking plot decisions, the developers have worked hard to bring a sense of familiarity to the program. One aspect that particularly sticks out is simply its aesthetics; the Keep itself has adopted the mosaic artwork that we have grown to associate with the franchise as we are greeted with tiled plot choices both pivotal and trivial in the style of what the developers refer to as ‘the tapestry’. 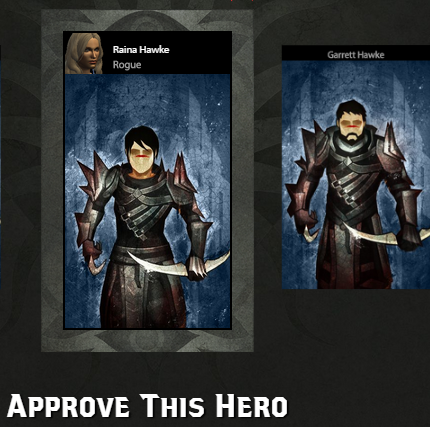 It is here that we are given full reign of exactly what happened to our Grey Warden and Hawke during their epic outings which, if played through beforehand, will appear as avatars when synced up to an active gamertag. When met with the tapestry, it is hard not to feel a little overwhelmed by all the choices that shape the particular world-state of Thedas when translated in to Dragon Age: Inquisition. However, the Keep offers a less intrusive way of editing such plot outcomes in that of an interactive cinematic that is voiced by none other than Dragon Age VA Brian Bloom (Varric Tethras). Having a fan-favourite character feels like a nice touch to the Keep that reinforces familiarity and one cannot help but think that this replicates the formula of Commander Shepard’s narration for Mass Effect Genesis, giving the illusion of a bigger spectacle. What is also pleasing to see is that specific plot outcomes that were available through certain DLCs such as Mark of the Assassin and The Exiled Prince have now been enabled to be reflected for players who had not purchased them previously. This clearly implicates that Bioware wants their fans, of all calibres, to be given the chance to enrich their world state as much as possible. So now, if a player ever wanted to stab Morrigan through the Eluvian at the end of the Witch Hunt DLC(and don’t lie, we’ve all wanted to do that at some point to Morrigan), the Keep has given them the option to do so. With the Keep being conceived as an extremely ambitious idea from the start, it is unavoidable however that the program would have its problems. More specifically, these issues have emerged through the program’s technical side. Understandably, with millions of players trying to access the Keep hourly, the browser-based program can fall victim to crashing and have difficulties saving when one tries to export their newly replicated world-state. Even in its beta stage this is something that the developers are fully aware of, and have therefore provided a helpful feedback textbox that proves handy when running in to any problems. Once again, it is understandable that a browser based program such as the Keep will experience problems from time to time; but if they are to add more plot choices over time, as they mentioned in The Keep FAQ, this is something that needs to be fixed as soon as possible. In conclusion, The Dragon Age Keep has been a long time coming for die-hard fans of the franchise; due to this, expectations cannot always be fulfilled. However, it goes without saying that Bioware have worked hard to re-create and reflect aspects of their hugely popular fantasy RPG in a program that is on a lesser scale of spectacle. And while it has its problems, for the most part it succeeds, somewhat of a triumph for something that is still in its beta stage. The Dragon Age Keep will definitely tide fans over until Dragon Age: Inquisition’s release towards the end of this month, and will no doubt surge speculation further in to what choices will reflect what outcome in the franchises’ newest addition. Dragon Age: Inquisition will be released on 21st November.